ENYA 2014, Queensway Connection: Elevating the Public Realm, is focused on re-imagining the linear landscape of the Queensway. 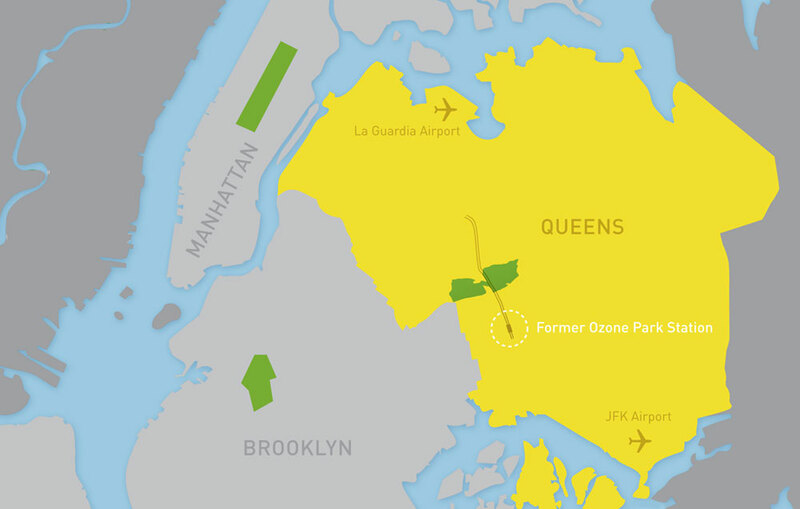 Queensway Connection: Elevating the Public Realm will support Friends of the Queensway and Trust for Public Land in their efforts to transform an abandoned rail right-of-way into a greenway that serves diverse neighborhoods in central and southern Queens. This conversion shares many similarities to the Bloomingdale trail conversion in Chicago, whose surrounding urban context is a significantly lower density than that of the High Line. ENYA is seeking to supplement the ongoing feasibility study for the railway’s transformation by envisioning ways the future park can be activated beyond a means of recreation and leisure. This competition emphasizes the importance of the park’s access points and questions whether they can be programmed and designed so that they extend the street activity onto the railway. ENYA believes that the key to making the Queensway a success is to engage the local community and to empower them to take ownership of the disused infrastructure. If nearby community groups, businesses and residents were allowed to “adopt” portions of the railway, the result would be a park whose usefulness was truly defined by the will of the community. Many portions of the QueensWay are already primed for such a transformation, however there also are locations which aren’t. The southern end of the railway will be most difficult to engage with the community because it is a narrow elevated viaduct isolated from the neighborhood. However, this portion is the most important to activate because it is very well connected to the City’s transportation network. ENYA is looking for ideas in how the future vertical connection to the viaduct can overcome the specific challenges of this site and contribute towards the activation of the overall QueensWay. Previous Previous post: New skatepark for Southbank Centre?